This ranch is located just outside Waco city limits, is Midway ISD, & has Lorena city water. The rolling terrain offers a large all-weather tank toward the front northwest corner. There is aprx 10-14 acres remaining that would be suitable for commercial frontage on the access road to I-35. 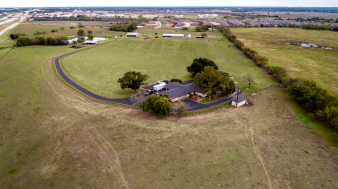 Currently the property is marketed for sale in its entirety; being approximately 39.86 acres of land and includes a single-family residence, in-ground pool/spa, asphalt paved drive, aprx 40'x100' stall barn (12 stalls) w/loft storage & feed room, aprx 80'x80' equipment/stall barn (4 large stalls), concrete floors & loading dock, includes office, bathroom (own septic) washer/dryer, tool, saddle, & feed room, newer large equipment/trailer/hay barn, elevator/steel grain bin, loafing shed, screened fishing hut, light standards, horse walker, well house/currently the well is not in use due to having city supplied water.